Located on the east end of Long Island in East Hampton, New York on three forested acres, the Arc House is a private modern residence designed with a stunning combination of glass, steel, stone and wood. Partially buried, over half of the 6,400 square foot subterranean construction home was prescribed by the owners who desired a pared-down aesthetic. The architect, Maziar Behrooz, says he was inspired by an F-16 fighter jet coming out of a hangar - a U.S. military's humble Quonset hut (a lightweight prefabricated structure of corrugated galvanized steel having a semicircular cross-section). 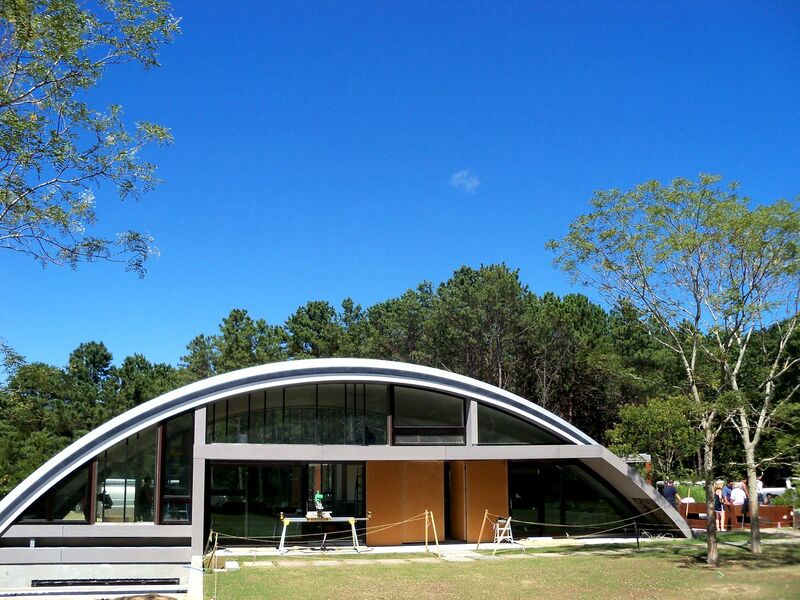 The roof and side walls of the Arc House's upper level are constructed with a 60-foot by 20-foot self-supporting corrugated steel arch. Green features include geothermal heating, a rainwater collection system on both ends of the arch, and a vegetated roof on the four-car garage, reached by a green surface of drivable grass embedded with Belgian block stones. 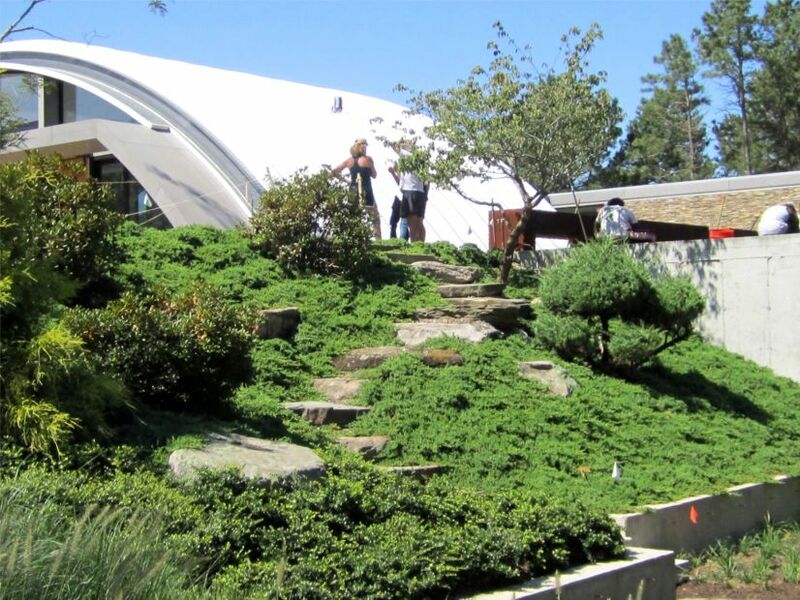 The sunken garage with the succulent garden on its roof juts out to one side of the home from a lower level. "The site is under a flight path to the local airport and close to a train track. We felt that by using an industrial building technology, an airplane hangar, we would transcend the perceived limitations of such proximities. Further, we were all seduced by the idea of a large column-less self-supporting canopy that enclosed all the public spaces of the house - cost effectively. The challenge was to find a scale for the arch that would transform this building system into an intimate and enclosed space. At a radius of 39� with a peak ceiling height of 16�, we felt the building would be small enough to feel comfortable and yet have a sense of largeness associated with its uninterrupted ceiling curve. "The lower level houses an office, a sitting room, a garage and work out areas; part of the lower level opens to a courtyard that allows cool air circulation and a distinctly private outdoor space. By splicing the house into the landscape, we were able to transform the flat site into one with multiple horizons and take advantage of natural cooling and passive design," (ArchDaily, 2011). Due to both the arc shape, underground spaces and materials used, including SIP panels, high-thermal windows, and closed-cell foam insulation, the energy usage of the house is significantly lower than an average house of this size. In 2011, the Arc House won Best Metal Roofing in the 2011 MCN Building and Roofing Awards and in 2009 the AIA Peconic Honor Award in Project Category when it was then called "Hangar House." 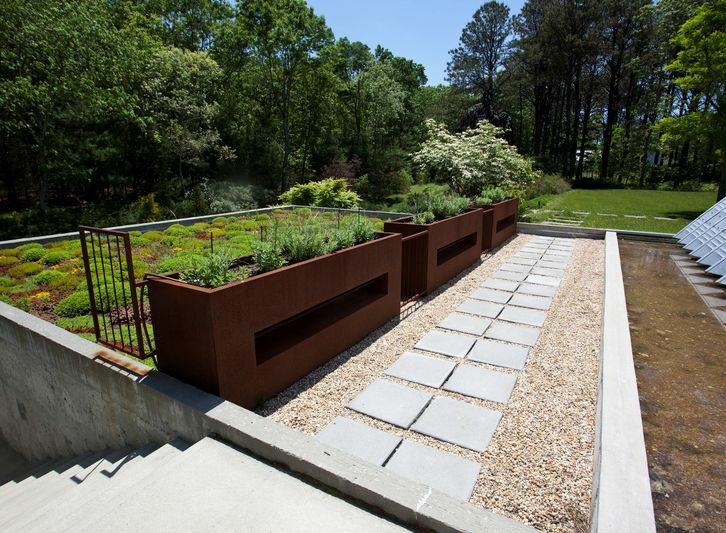 The green roof completed the landscape for the Arc House acts in a manner such as an infinity pool: the vegetation blends into the background providing a seamless appearance. 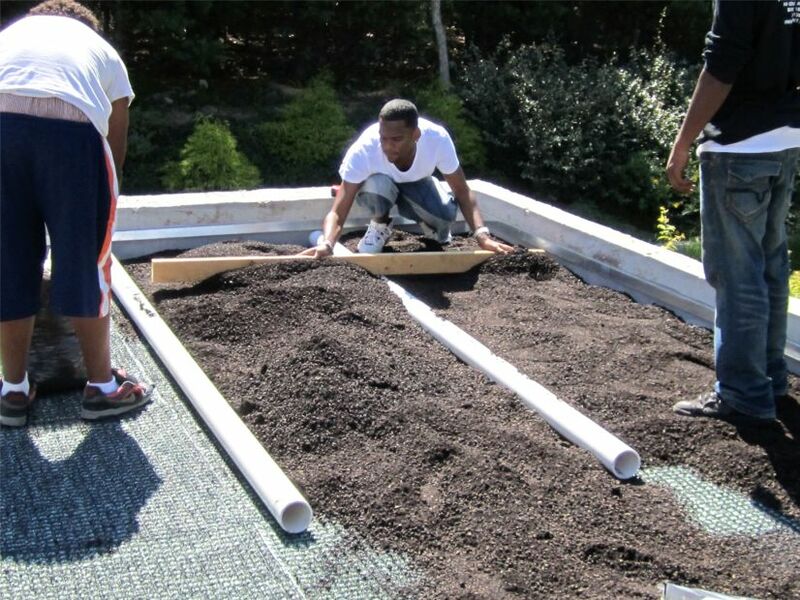 This project was a culminating activity by Bronx students at the GLTi beta classroom as part of a four year program that implemented Green Living Technologies' green roofs and walls to enhance student learning. The MEWU (Mobile Edible Wall Unit) is the signature classroom tool used for indoor vertical farming. The unit provides the means to have a classroom school garden every month of the year. Designed by former teacher and GLTi President George Irwin, the unit is a staple for the GLTi Educational Programming that has documented 93% attendance, 100% passing the NY School Regents Exam and experiencing 100% graduation during the four year experience. Students learn about CORE subject matter in an authentic application where skills can be transferred to standardized testing. Students learn about biology and earth science through the GLTi program by blending and testing different growing medias and then actually installing them as culminating activities like the Arc House. The business classes prepare action plans and written work for the vertical farms, weights and measures are assessed by the students, and data is collected while weighing dry and saturated media. The program teaches students to problem solve and learn critical thinking through some of the most advanced green roof and wall technologies. The students are learning by using real world technology that has become mainstream. Not all students enjoy the physical work; many are attracted to data collection, scientific testing, and engineering - many of the skills that make up STEM (Science Technology Engineering and Math). 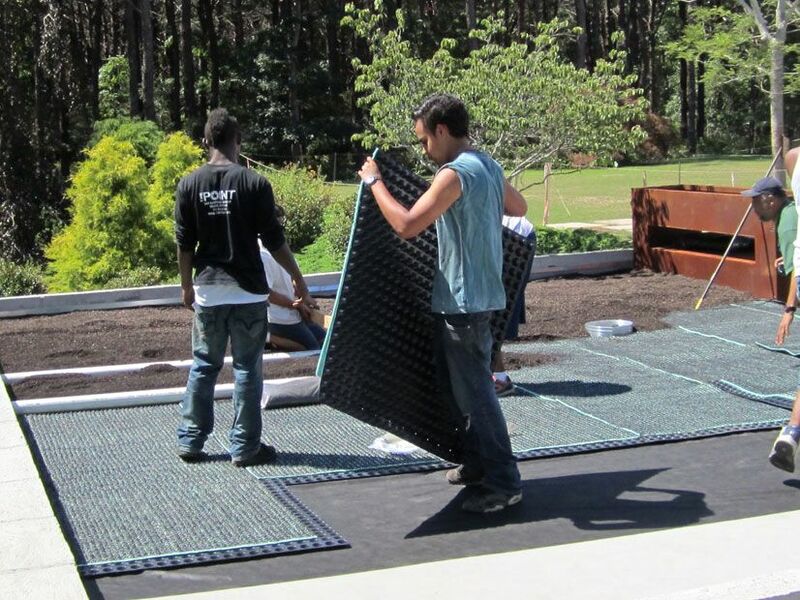 This program allows third year students the opportunity to take part in the authentic maintenance of a green roof or wall that they installed. 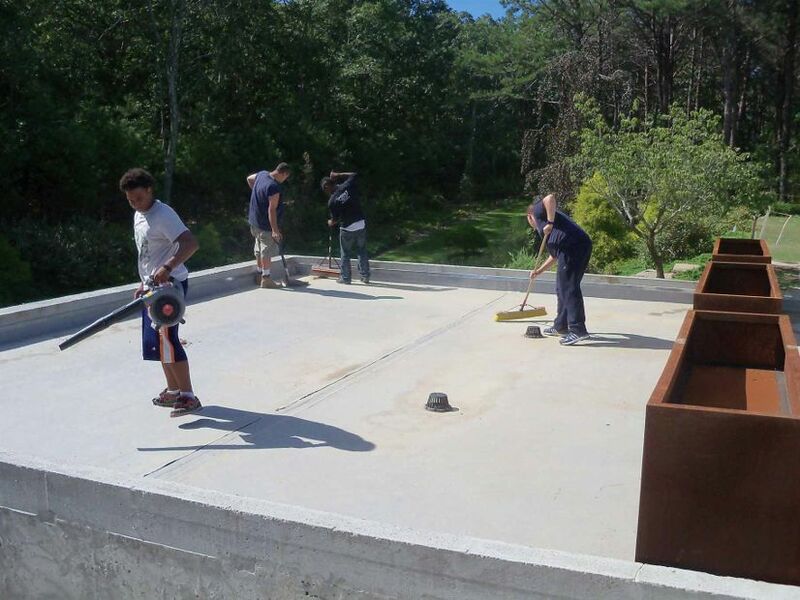 As a senior they plan the installation to add sections to an already existing green roof, starting with their own school - the benefit to the school is they get green roofs for pennies on the dollar since it is part of a larger curriculum. It has been a win-win for schools, students, and the environment. 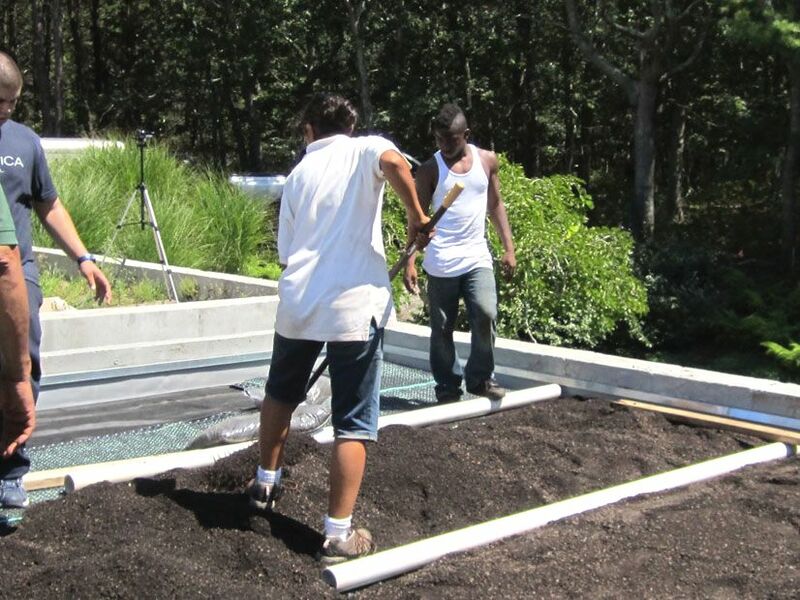 The Arc House was the 2010 year end culminating activity that capped a full year of learning; students had a chance to earn a living wage, practice the skills they learned in the classroom, and enjoy the surroundings of a project in East Hampton they may have never ventured to see. 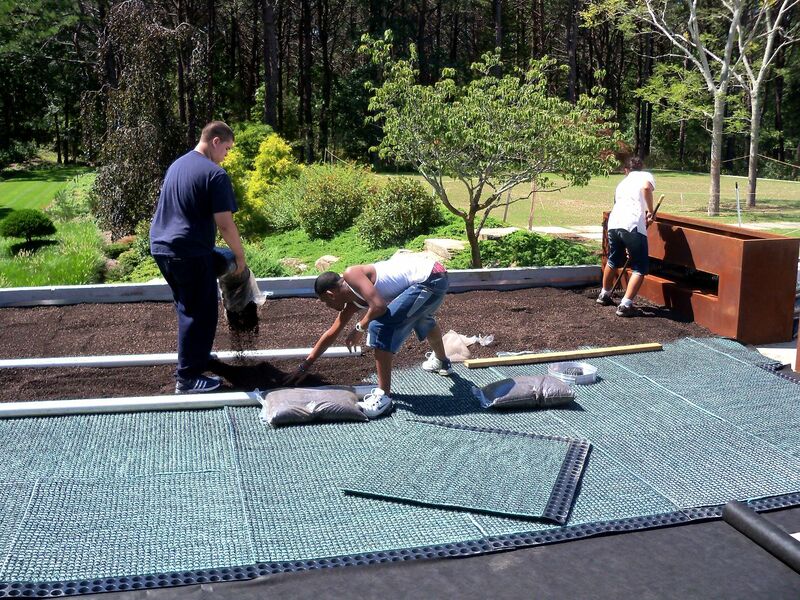 These types of projects are the apex of the GLTi education program. Other programs in the planning include Boston, NJ, and various university programs.